What Should First Time Fliers Know About Private Air Charter? Flying private is definitely more expensive than taking a regular commercial flight, but it’s definitely the best way to travel if you have the money. A private jet charter can take you wherever you’re going much faster than a commercial airline. If you are planning to charter a private plane, there are few things that you will need to know first. The better prepared you are for your first charter experience, the smoother things will go. One of the best things about using a private air charter is that you determine the schedule. If you suddenly need to change your plans to fly somewhere else, you can get to where you need to be without any issues. You won’t have to rearrange your schedule at all, because there are no set flight schedules. Being able to choose exactly when you want to fly is a huge convenience, and it’s one of the main reasons so many people choose this option. You don’t need to worry about connecting flights or layovers either. Unless the plane needs to stop for fuel because you’re traveling a long distance, it is always a nonstop flight to wherever you are going. Also, private planes are much smaller than commercial airplanes, so there are many more airstrip options for landing. This means that you will be able to get closer to your destination than you would if flying on a traditional airline. And, it also means you have access to various destinations that aren’t accessible via commercial airlines including unique Caribbean destinations. It’s always a good idea to book your private flight in advance because charter operators need to verify plane and crew availability. Depending on your destination and the availability of aircraft and crew, you typically can choose from a few different aircraft when you book your flight. Heavy jets can seat up to 16 passengers, and they have the largest cabins. These jets are also the most expensive, but they are very luxurious. A heavy jet can go up to 7,000 miles without stopping before it needs to refuel. They have high ceilings, full size galleys and the most amenities by far. Midsize jets can seat up to 9 passengers, and they can go up to 4,000 miles before refueling is necessary. The Gulfstream G280, Citation XLS and Hawker 800XP are just a few examples of mid-size jets. They have stand-up cabins and enclosed restrooms. Light jets can travel up to 2,800 miles without stopping, and they seat up to 8 passengers at once. There are typically miniature galleys and in-flight entertainment as well as food service. These are the cheapest private jets that you can charter, but they still offer an impressive level of luxury when compared to commercial airlines. Additionally, many operators provide turboprop options like the Pilatus PC-12 or the King Air. These aircraft offer a lot of the same amenities as jets, but are far less expensive. If you’re trying to make your private flying experience more affordable, definitely ask about these. It can be difficult to work while flying on a commercial airplane due to space constraints, but private aircraft provide you with all the space you need. Many private aircraft offer access to Wi-Fi and satellite phone service, so you will be able to make calls and access the internet without any issues. 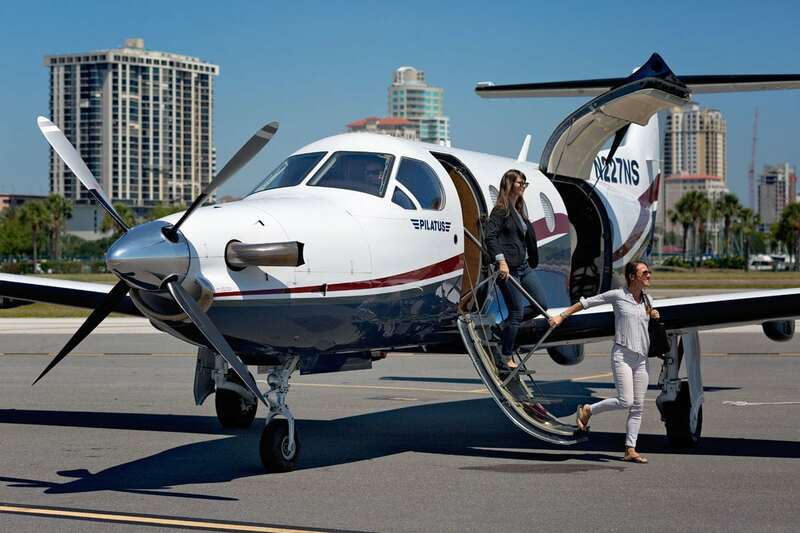 Those who fly with commercial airlines are accustomed to showing up hours in advance for that flight, but that’s not necessary with a private air charter. The plane will take off shortly after you arrive, and the security check doesn’t take nearly as long as it does for commercial flyers. While it’s still a good idea to show a little early, you certainly don’t need to set aside two or three hours. Most private air charter companies provide passengers with in-flight catering service for an additional charge. Operators are usually happy to accommodate specific requests for not only food, but alcohol. All you have to do is ask when you book the plane. When you charter a private jet, you will be flying by yourself or with anyone you want to take with you. You won’t have to worry about loud or obnoxious passengers making your flight difficult. It’s important to note that there is a limit to the number of people that you can bring with you, depending on the size of the aircraft. Chartering a private plane can be very expensive, though it depends on the charter company and aircraft you choose. There are definitely some more affordable options available, and it’s important that you take the time to review some of your options. It can cost anywhere from $1,800 to $2,500 an hour to charter a smaller jet or turboprop, and $4,500 to $7,500 an hour to charger a jet with a larger cabin. While it’s true that chartering a private aircraft is usually more expensive than a first-class flight, there are quite a few economic options available. The money that you spend on these services will be well worth it when you consider the level of privacy, convenience and luxury that you will enjoy. Private aircrafts can only accommodate so much luggage, you will need to know what the limit is before brining your bags to the airport. A majority of these charter companies impose luggage limits, so you must keep this in mind. If your luggage and passenger weights are over the acceptable limit then you will have to leave luggage behind. These weight limits are imposed because it’s not safe for aircraft to take off when there is too much weight onboard. Those who charter their own plane don’t need to worry about waiting in long security lines, but you will still have to bring your ID. You can use your driver’s license if you are traveling domestically or a passport if you are boarding an international flight. It is important to keep in mind that flying on a private plane is completely safe, and in fact it can be even safer than commercial flight. The chances of a serious incident occurring on a private aircraft are extremely low. Many people who fly on a private aircraft for the first time are nervous, but there is no need to be. These aircrafts are regularly inspected and maintained just like commercial airplanes. It wouldn’t even occur to many people, but tipping the pilot is actually fairly standard when you are chartering a private jet. You can tip anywhere from $20 to over $1,000, depending on the length of the flight. You aren’t required to tip, but it’s still something to consider. If you plan on taking any of your pets with you on the aircraft, it’s a good idea to check with the flight planner first. You should also find out what the charter company’s policy is when it comes to traveling with pets. Most of the time you can bring any pets you want with you, unless it is an international flight. If you are going to be traveling internationally, you will need to take the necessary measures beforehand so you are in compliance with all relevant laws. There is nothing quite like flying on a private aircraft, but you will want to be prepared for the experience. Whether you are in the process of making a decision or you have already booked a flight, it’s good to know what to expect. Private chartered flights are extremely luxurious and should provide you with everything you need. You can expect all of the amenities you would get in a first-class commercial flight and then some. Are you ready to fly private? Get a quote from us.